Almost 3D effect of red flames leaping from behing the pupil thanks to a black ragged edge backdrop. If you're looking for an effect of a deeper and more bloody gaze than with regular vampire contact lenses but you're not willing to try scleral contacts, ColourVue Volturi are the way to go! These 'Twilight' inspired contact lenses feature more irregular black colouring, which makes your eyes look even more mesmerizing than with regular red contacts. 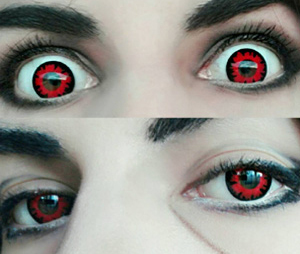 ColourVue Volturi contact lenses are perfect for Halloween and other costume events where a creepy look is required. Order now!